Four weeks ago, I went on strike with more than 39,000 of my union brothers and sisters. Striking is never an easy decision, and I did not make the decision lightly. As a part of this strike, I feel like you need to know what is on the line for my family. I am a single mother of two gorgeous teenage girls who I adore. They are my life. They are the reason that I am the person I am today, and they are the reason that I need a contract that includes job security, a job in my community, and affordable health benefits. They are why I am fighting so hard. Me walking the picket line. Raising daughters is a difficult task in itself, but imagine raising one with a birth defect that affects her daily life. My youngest daughter Halley was born in May of 2001 with a bilateral cleft lip and palate. She had a large hole in her palate, and her lip was not fully developed. She was unable to eat or drink normally. At the time, she was diagnosed as one of the most extreme cases ever recorded in my state. The doctors assured me that after a few surgeries, she could live a normal life. I promise you that there is nothing normal about handing your baby over for surgery every few years. She has undergone five surgeries to date, and she requires a few more. My health coverage during her younger years covered her surgeries and the extensive hospital stay associated with each surgery. I have always been grateful for that coverage. Changes to the health coverages offered by Verizon could prevent us from getting the help Halley needs to complete her health care plan. I am currently paying out of pocket for orthodontics; I am now paying for her fifth set of braces. Affordable health care is not an option for me — it is a necessity. Is she worth it? Absolutely. Being a single mother is not something I chose for my girls. Life happened to my family, and we are not allowing that to impede our dreams. My girls are active in many things including marching band and music programs, FFA, and 4-H. These activities have made me a band mother, a farm mother, and a 4-H volunteer because I have chosen to be an active part of my childrens’ lives. 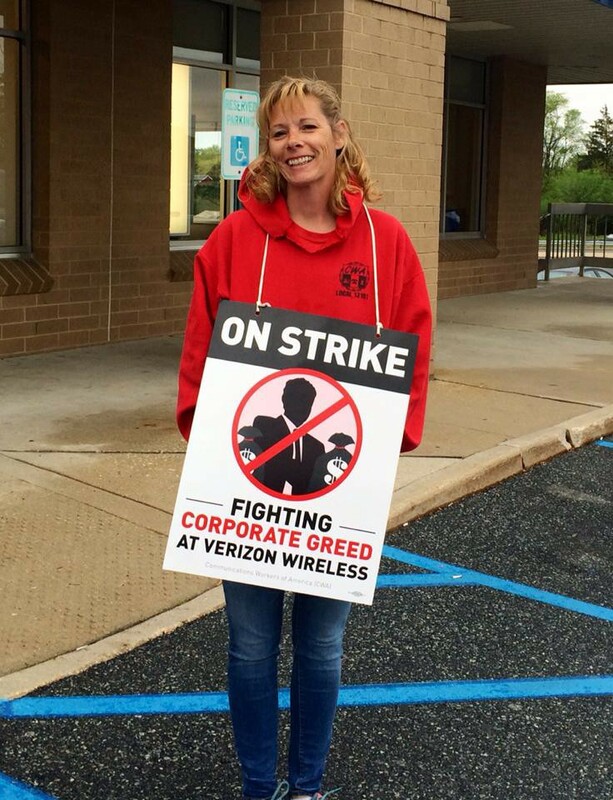 Unfortunately, Verizon wants to close call centers, like mine, and move jobs to another state or city. If mine closes, this change in location would cost me hours in commute and take away from my time with my girls. I would no longer be the band mom to over 40 children. I would no longer be able to the farm mom or 4-H volunteer. Changing my work location would take away much of what I hold dear — spending my time with my children. I am sure that is not the intention of the move, but please realize it is the result. I am not just a number Mr. McAdam. I am someone’s mom. When making changes and negotiating this contract, please remember that we all have lives and stories. Our stories are what make us human and real. I am trying to raise my children to be responsible adults, and I am leading by example. Please try do the same when dealing with our jobs. Please be the corporate leader that other companies follow, not because you make money, but because you make families possible. I want to be there for my kids, and I want to be able to tell them that Verizon is helping us on our journey. Allow me to raise my kids in my community; provide me healthcare I can afford. I will always be their mother, but will I have a job that allows me to be a mom? I hope I can. Oddly specific. Universally applicable. Submit your writing to biggerpicturemedium@gmail.com.